This page will look at Willian Ryan father of Anna Ryan Johnson. Anna (Agnes) was the mother of Ellsworth and grandmother of Eugene Johnson. 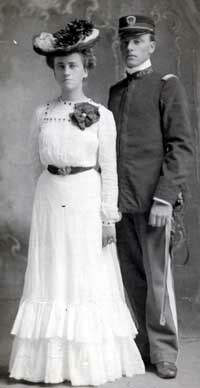 Iver and Anna Ryan were married January 30, 1905. “… Married at West Point, Monday, January 30, 1905, Mr. Iver Johnson and Miss Anna Ryan, both of this county. The newly wedded couple is some of Stanton County’s best people. The bride was one of our best teachers and for some time ran a dressmaker’s shop in this city. She was born and reared in Stanton County and the host of her friends shows her true loveliness in many excellent traits of character. The bridegroom is a son of Mr. and Mrs. Sven Johnson and one of our rising young men. He is 1st Lieutenant in company B and has done excellent work in building up a splendid militia company. He was the republican candidate for county clerk a year ago last fall. Mr. Johnson is one of our most energetic citizens. He is full of life and vigorous manhood, a hard worker and generous to a fault..."
The following is an excerpt from a letter written by Clifford Johnson grandson of William and Caroline Wittler Ryan. “(Per family legend) The Ryans – 4 brothers came over during the Civil war. The three older Ryan brothers joined the Army. Whether they were forced or volunteered we don’t know. Mary Ryan, daughter of William Ryan, tried but failed (to find out). The three brothers died in the battle of Bull Run. … William Ryan was too young for the Army so he was left to shift for himself. He landed in Illinois. We were told some family by the name of Wittler raised him. I believe he later married a Wittler. “William Ryan, a farmer living on Section 20, Humbug precinct, came to Stanton County in the spring of 1883, locating on his present place, which then consisted of a half-section of wild land, upon which he made many valuable improvements, including a good farm house sixteen feet square, a barn 56 x 56 feet, a granary, tool-house and other out-buildings, also provided his place with good wells and erected a wind-mill for pumping purposes. Of his present farm, one hundred and twenty-five acres are under the plow, the whole surrounded by a fence and sub-divided by cross-fences. Mr. Ryan is a native of Ireland, born March, 1836, the son of William and Johannah Ryan, whose six children were: Michael, Mary, Thomas, Patrick, Charles and William. He is (the one) of whom we write this notice, lived in the land of his nativity until fifteen years of age, and then came to this country. He landed at Boston, from there going to Manchester, New Hampshire, where he learned the shoe-making trade, but after eight months abandoned this and for one year drove a team on the railroad. He then spent four months in New York City, and from there went to Ohio, where he followed farming four years, followed railroad work in Pennsylvania and later went to St. Louis, continuing to work at railroading until 1866, when he came to Iowa (I think this should read Illinois because he married Caroline Wittler in 1867 at Chattsworth, Illinois) and followed railroad work until he came to Stanton County, Nebraska. When young he was not afforded a good education, the advantages then not being what they are today. November, 1867, he was united in marriage to Caroline Wittler, the daughter of Frank and Barbara Wittler, natives of Sulsbach, Mosbach Baden, Germany, whose nine children were: Margaret (deceased), Frank (deceased), Caroline, George, Charles (deceased), Rosa, Joseph (deceased), Elizabeth and Lena. Our subject and his wife have been blessed with nine children, as follows: Rosa, George, Elizabeth, Catharine, Mary, Sarah, Agnes (Anna), Joseph and William." The following obituary for William Ryan was printed in the August 7, 1903 edition of the Stanton Register. Died at his home northeast of Stanton of Paralysis on Sunday at 7:10 a.m. William Ryan age 67 years, 4 months, and 20 days. The funeral services werer held in the Catholic church at Wisner Tuesday. A large number of his friends in this county attended the burial services. The deceased was born in Limerick, Ireland, on March 2nd, 1836 and came to America with his brothers when 15 years old. He became separated from his brothers during the Civil War. In 1862, the deceased was married at Peru, Illinois, to Miss. Caroline Wittler, they lived on a farm near Peru until 1883 when the family moved to Nebraska. Ten children came to bless the union, six girls and four boys. Nine of the children and the loving wife survive him and mourn the loss of one who was always a kind and loving husband and father. The following obituary for Caroline Wittler Ryan was printed in the November 21, 1907 issue of the Stanton Weekly Picket. Mrs. Caroline Wittler Ryan was born at Sulsbach, Mosbach Baden, Germany, September 20, 1840, and when eighteen years old came to Peru, Illinois. In 1863 she was married to William Ryan who died at Pilger August 3, 1903. in 1882 Mr. and Mrs. Ryan came to Nebraska and settled at Pilger. Ten children came to bless their home of whom nine are living. They are: Mrs. Rose Milligan, Stanton; George J. Ryan, Draper, S.D. ; Mrs. Elizabeth Quigley, Tilden; Mrs. Katherine Filter, Council Bluffs; Mrs. Anna Johnson, Stanton; Mary, Sarah, Joe, And Will Ryan, Pilger. Deceased leaves a brother and three sisters. The brother, George Wittler, residing at Chattsworth, Illinois, arrived Monday afternoon. 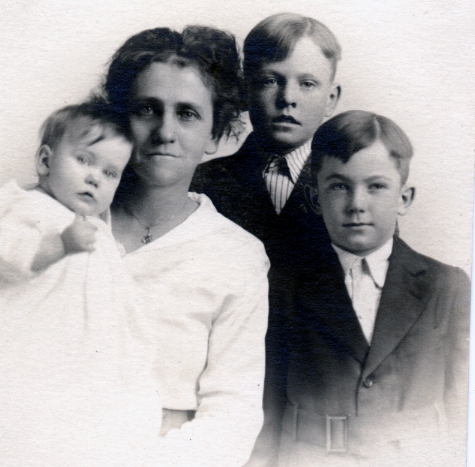 Anna Ryan was born at Chattsworth, Illinois, January 17, 1877. In 1882, at age 5, She moved with her family to Stanton County. She attended school district 7 and then Wayne State Normal College after which she taught school 7 seven years in Stanton County rural schools. The following picture shows her receiving her teaching deploma from Wayne State College. The first picture was taken at "Cravaen (studio)" Wayne, Nebraska. The caption is: Anna Ryan, Teachers Class, August 12, 1896, (age 19) Wayne, Nebraska. Then a signature: Mrs Wm. Ryan. The second picture was taken at Marcy studio, Norfolk, Nebraska, and is with Iver. 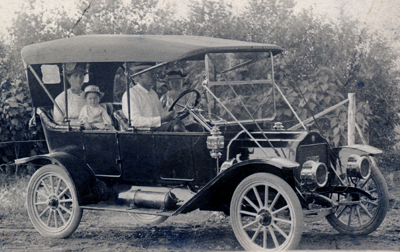 The caption says July 4, 1902, Norfolk, Nebraska. However, it also says Iver Johnson & wife Anna A. Ryan. This date conflicts with a marriage date of January 30, 1905. Also, it looks like a ring on her finger in the picture so maybe the caption date is wrong and it should be after the wedding in 1905. 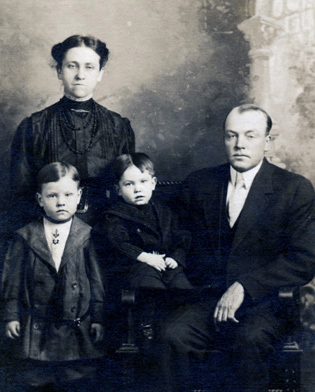 There were three children in the Iver Johnson family, Clifford, Ellsworth and Ivera. The following pictures show the family. 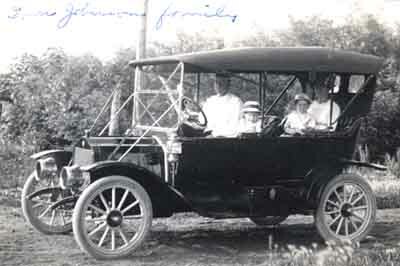 The caption on the second picture says: "Johnson family taken 1912 at Norfolk. I haven't been able to identify the car. I notice it is a right hand drive. It looks like Clifford is in front and Ellsworth in the back. How about those hats! The last picture of Anna, Clifford, Ellsworth, and Ivera is priceless!!! The following obituary for Anna Ryan Johnson appeared in the June 17, 1954 edition of the Stanton Register. Requiem mass was said at St. Peters Catholic church this morning for Mrs. Anna Johnson, 77, over seventy-year resident of Stanton County. Pallbearers were Harold Sanders, Charles Busch, Ed Ackerman, Reuben Dickenson, John Morfeld, and Anton Drahota. Interment was in the Stanton Cemetery. 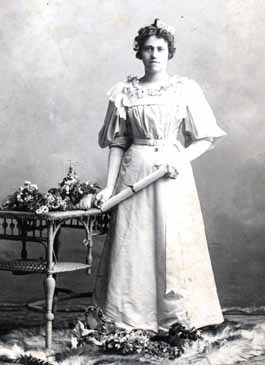 Born at Chatsworth, Ill. On January 17, 1877, the daughter of William and Caroline Ryan. 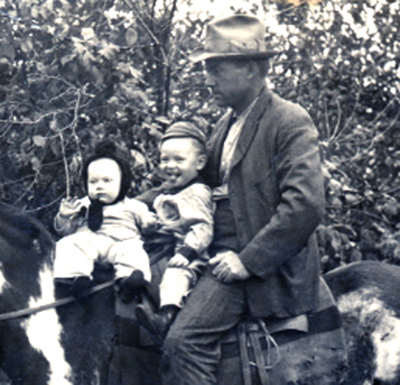 The family moved to Stanton County in 1882 where Mrs. Johnson had lived since. She attended school district seven and after attending Wayne State Normal returned to teach in this county’s rural schools for seven years. Survivors include: a daughter, Mrs. Leonard Morfeld (Ivera) of Langley Field, Va,; two sons, Ellsworth and Clifford, both Stanton County farmers; a sister, Mary Ryan of Omaha; and nine grandchildren. She was preceded in death by her husband, her parents, four sisters and two brothers.